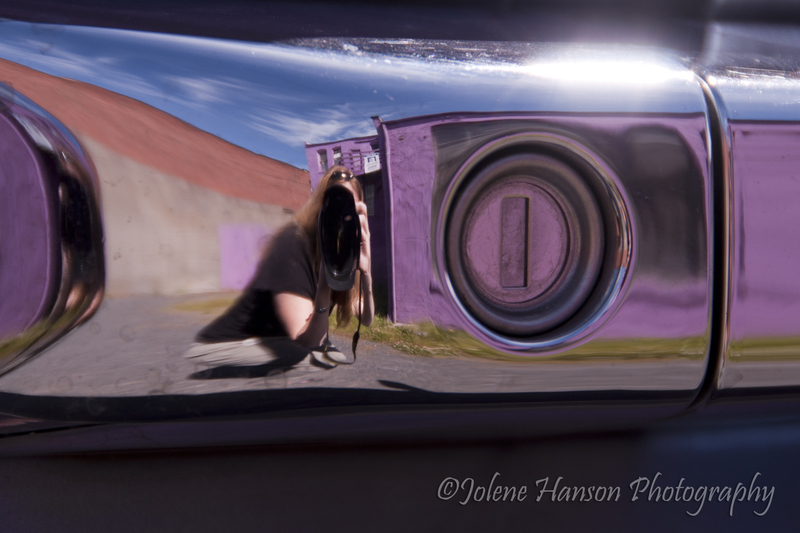 The distorted images in David’s minivan door handle quickly became my photo walk favorite today, although the purple abandoned building in the background did give me plenty of good material to post later this week. I also have photog tales of peril involving a hot roof, barbed wire, and a mysterious man named Dave aboard a rusted vessel named Rebound. That’s for later, of course. Great self portrait, Jolene. All the bright colours and razor sharp details of the handle gives it great look. Thank you, Tomas…I was lucky to have looked down before getting inside the van. Otherwise I’d have missed it. This is pretty cool, Jolene! Very creative self-portrait Jolene. I like your use of the purple building… adds a nice splash of bright color. Sorry I missed you Sunday. Great shot Jolene! I love the colors of the sky and building in the reflection! Thanks, Jim – this was a fun one to do! Well due to the “abandoned purple building” I just made a connection between you and David. LOL small world right! I really like this self-portrait. Something I’ve never done. I hate photos of me so I don’t waste my time LOL! But this is very creative! Thanks, Bonnie! I’m actually on WordPress because David talked it up so much. We’ve worked together for like a decade now. Did you read this through Google Reader, David? I just got a referring hit from there. Haha.